“If you’re interested in experimental art and Jewish mysticism, you need to go out and investigate Wally Berman’s work. But you’ll have to do some digging to get to it,” said late legendary Beat poet David Meltzer, concluding what turned out to be our last conversation. The weight of that moment stayed with me for the past two years, before an opportunity to follow through presented itself: I heard about an upcoming memoir by Wallace Berman’s son, Tosh, and arranged a meeting. Before long, I’ve come to realize just how right Meltzer was. As it happens, I now also understand the mischievous smirk that accompanied his comment. The creator of striking large-scale multimedia collages that “blur biographical memory with South American mythology,” María Berrio is a Colombian-born artist living and working in New York City. 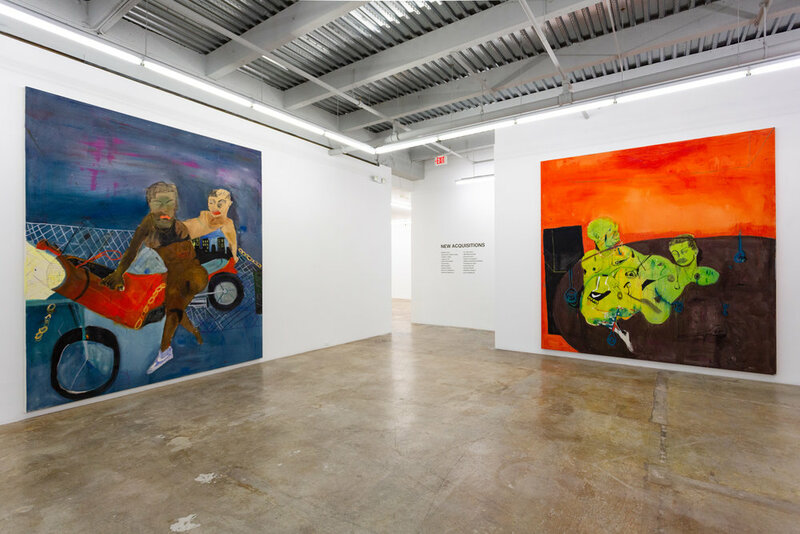 A graduate of the Parsons School of Design (BFA) and the School of Visual Art (MFA), Berrio has exhibited her work in solo and group exhibitions throughout the world, most recently at the Prospect 4 triennial in New Orleans. She has also created murals in Harlem and in Puebla, Mexico, and is currently working with NYC’s Metropolitan Transportation Authority to mount a public work titled There Is Magic Underneath It All. In the pieces included in this portfolio, Berrio’s fascinating heroines and delicate watercolor painting, as well as the lush colors and textures of the handmade Japanese papers she employs, contribute to her captivating twenty-first-century magical realism. Kohn Gallery showed two artists in conversation. John Altoon was working in the 60s, and Jonathan Lyndon Chase is very much of today, but both explore the various boundaries of the body through their dynamic work. Altoon’s ink on board drawings, comprised of chaotic zig-zags, sit alongside Lyndon Chase’s color drenched studies of queer black men. Gallerist Josh Friedman told me that by midday, three institutions (including Minneapolis’s Walker Art Center and the Institute of Contemporary Art Miami) had already purchased the bright, large-scale paintings of young Philadelphia-based artist Jonathan Lyndon Chase. In keeping with the market trend of the past couple of years, there was also significant interest in works by artists of colour. Representatives of several museums rushed to Los Angeles-based Kohn Gallery’s booth to bid on Jonathan Lyndon Chase’s Dawn Embrace (2019), which sold for an undisclosed amount to the Walker Art Center in Minneapolis, while another of the young painter’s works went to ICA Miami. Roberts Projects sold works by Kehinde Wiley and Jeffrey Gibson ranging from $150,000 to $300,000 and notes “multiple institutional reserves”. February 22, 2019 in Lebrija, News. Lita Albuquerque knelt down to get closer to the ground. The land has long doubled as her muse and her canvas: She drew constellations into Egypt's Giza Plateau, she mimicked the night sky on a lake bed in the Mojave Desert, she aligned spheres to stars in space while in Antarctica on the summer solstice — 99 orbs in her signature ultramarine, a vibrant hue hearkening to the Tunisian skies of her childhood. February 12, 2019 in Martinez Celaya, News., News..
January 24, 2019 in Conner, News. It is difficult to categorize the boundary-breaking, multi-media trajectory of American artist Bruce Conner (1933 – 2008). Constant change and a wide-roving, obsessive curiosity are perhaps two constants in Conner’s work, which ranges from assemblage to drawing, painting and sculpture to conceptual art and experimental film. January 02, 2019 in Loy, News. In Leipzig-based painter Rosa Loy’s phantasmagoric compositions, the industrious, rosy-cheeked women of socialist realism are recast in Kafkaesque mise-en-scènes, in which they farm human-faced heads of lettuce, feed lollipops to Harpies wearing headbands, and recline on couches in poses of analysands more than odalisques. December 22, 2018 in Loy, News.. Propaganda and art are often thought of as opposites: The former rehashing cliches to serve the powers that be, and the latter inspiring individuals to believe they are in the presence of something special — a unique human expression, unlike anything else in the world. December 14, 2018 in Loy, News..
December 07, 2018 in Chase, News. This week, Jonathan Lyndon Chase debuted a series of new paintings at the Rubell Family Collection (RFC) in Miami. The works are part of the space’s annual “New Acquisitions” exhibition, and a result of the artist’s participation in a 2018 off-site RFC residency. Last week, Whitewall visited Lyndon Chase in his new Philadelphia studio to talk about making his largest works yet and what he’s showing in Kohn Gallery’s booth at Art Basel in Miami Beach.